ChurchApp rebranding to ChurchSuite - how does it affect my church? The good news is that the rebranding of ChurchApp to ChurchSuite will have next to no obvious impact for your users or church members. From 12th June they'll automatically be redirected from any ChurchApp pages to the new ChurchSuite pages. Existing embedded content will continue to work for the next few months, and while the name has changed, our logo and brand colours are unchanged. The following suggestions may be useful as you consider how to communicate the changes to your users and church members, and also how to update any web-embedded content. If your church is using the member-facing My ChurchApp, you'll want to begin changing the language you use in your member-facing communications, Sunday notices, and your weekend service Information Point, to My ChurchSuite. 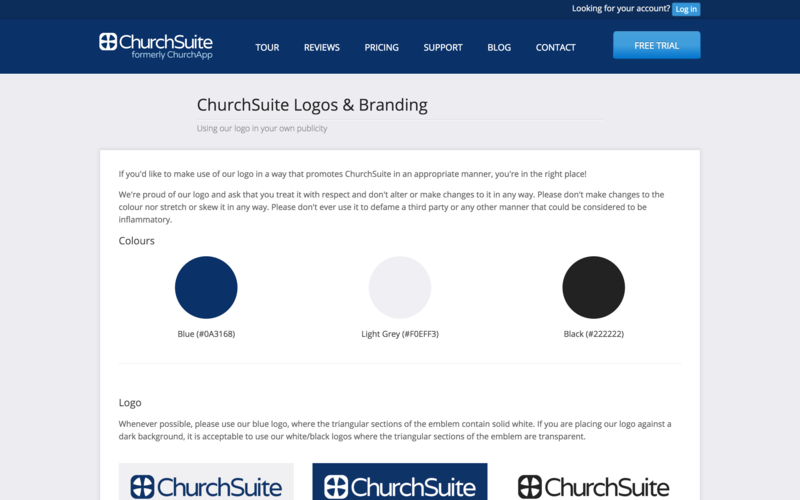 You can download ChurchSuite logos and branding from our website here. This may be helpful in updating your publicity and communications e.g. logos used in powerpoint slides for notices, logos used in your website etc. Here are the links to the new ChurchSuite apps for Android and iOS. Requires iOS 10 or Android 4.1 minimum. Older operating systems can no longer be supported. Those with older devices who still have the old ChurchApp app may prefer to continue to use this, although we can no longer update that app. Those will older devices can also access ChurchSuite and My ChurchSuite via their device's web browser. We suggest app users not delete their old ChurchApp until they have confirmed their device meets the minimum requirements for the new ChurchSuite app. 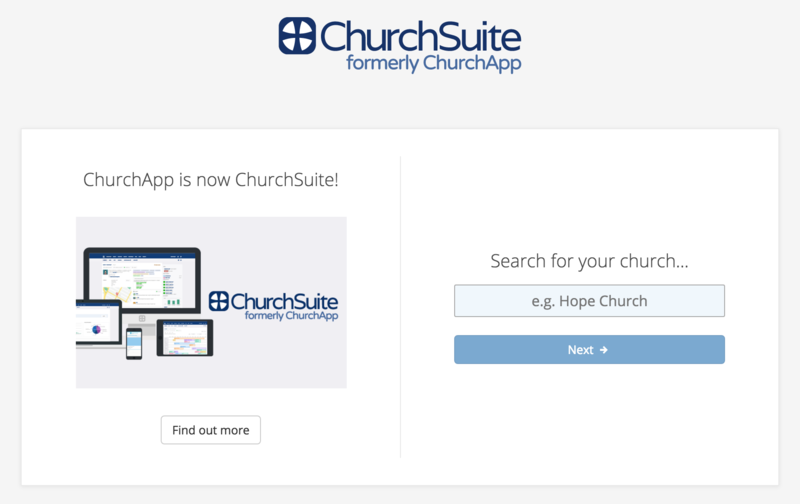 You may wish to communicate that newly-named ChurchSuite apps are now available for download. While the former ChurchApp iOS and Android apps will continue to work, they are no longer being updated; we therefore encourage your users and church members to switch over to the new ChurchSuite apps as soon as possible. When updating to the ChurchSuite apps, they'll need to re-enter their login details and re-add their optional app PIN. The following support article explains how to download, login and navigate the apps. For My ChurchSuite, your church members may need reminding that they log in with their email address and My ChurchSuite password (My ChurchApp passwords are unchanged), and for your admin-facing ChurchSuite system, Users log in with their Username and ChurchSuite password (ChurchApp User passwords are unchanged). If you are using ChurchApp's API, you may wish to review your code and update any endpoints to the new ChurchSuite endpoints. We've updated the GitHub support documentation, which can be downloaded here. If you have any embedded ChurchApp content - Donate, Event pages, Calendar embed, Featured Event embed, embedded Newcomer Connect Form, or embedded Small Group lists or maps - you may wish to review the embedded code to reflect the new ChurchSuite code; updating and code that says "churchapp.co.uk" to "churchsuite.co.uk". We'll get in touch again in the future to let you know when old ChurchApp embed links are being deactivated, but you don't need to wait; you can easily make the change to ChurchSuite code now. 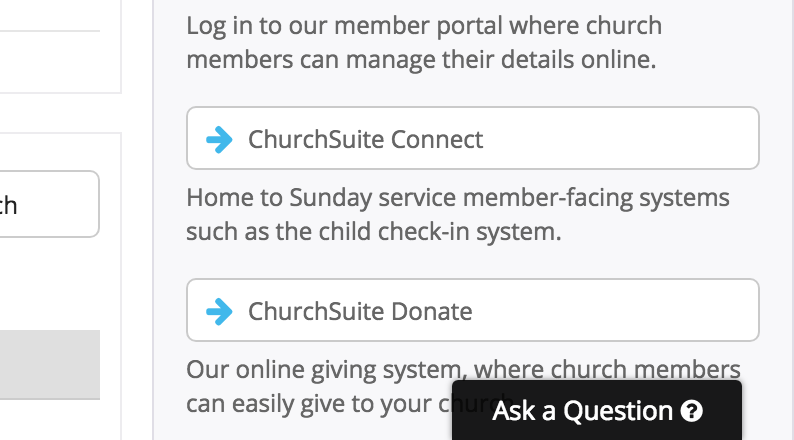 If you have embedded links to ChurchSuite's online giving Donate platform, you may be interested in new button graphics. These are available for download here. If you have a church member section on your website, perhaps with shortcut links to the former My ChurchApp login page, you'll want to update that section to now refer to My ChurchSuite. The new ChurchSuite login is login.churchsuite.com. Your Users may have shortcuts or bookmarks for ChurchApp that should now be updated to ChurchSuite URLs; updating "churchapp.co.uk" to "churchsuite.co.uk". 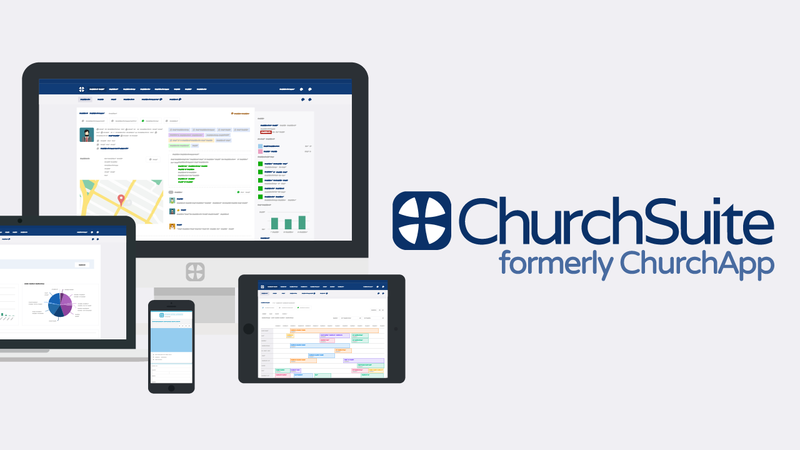 If you use ChurchApp Connect for Child Check-In or on a laptop or portable device at your Information Desk, you may wish to update any saved bookmarks for the check-in system. The new Connect login link is login.churchsuite.com. The new ChurchSuite website is churchsuite.com. The former ChurchApp websites www.churchapp.co.uk and www.churchapp.org both redirect to the new ChurchSuite website. The new "Support" email address is support@churchsuite.com. The former ChurchApp support email addresses support@churchapp.co.uk and support@churchapp.org both re-route emails to the new ChurchSuite support email address. Our support articles have moved from support.churchapp.co.uk to support.churchsuite.com. All our support articles continue to be available through the "Ask a Question" support beacon in the bottom right hand corner of every page in ChurchSuite.